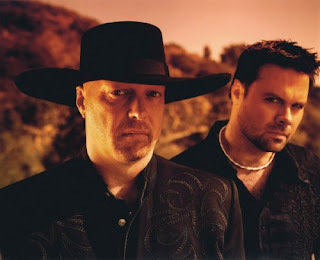 Montgomery Gentry, has parted ways with their long time label, Columbia Records. The platinum pals hit career high points with awards such as CMA Duo of the Year (2000) and ACM Top New Group/Duo (2000). Signed in 1999 to Columbia Records, the duo released its debut album Tattoos and Scars that year. They have since recorded five more studio albums: Carrying On (2001), My Town (2002), You Do Your Thing (2004), Some People Change (2006), and Back When I Knew It All (2008) as well as a Greatest Hits package. These albums have produced more than twenty chart singles for the duo on the Billboard Hot Country Songs charts, including the Number One hits "If You Ever Stop Loving Me", "Something to Be Proud Of", "Lucky Man", "Back When I Knew It All" and "Roll with Me" and ten more Top Ten hits.The group’s latest release, For Our Heroes , was a Cracker Barrel exclusive that sold 25,933 debut week units in May of 2009. The parting most likely has to do with the recent performance at radio of MG's last two singles. The duo released "Oughta Be More Songs About That" on November 30, 2009 which peaked at number 40 on the Hot Country Songs chart in January of this year. That single became their lowest charting single to date. A second single, "While You're Still Young", was released in April 2010 and peaked at 32 in August. The music industry can be a real BEAR !